Integrate Marketing, Finance and Operations to find new business and profit sources! There has been a growing interest in business model innovation (BMI) -- what is it and how does one go about innovating their business model? Complement your existing analytical tools by learning to apply BMI before your competition does! Learn to speak boardroom language and even guide discussions! The BUSINESS MODEL INNOVATION course will show you concepts, tools, frameworks and methodologies behind the Business Model Innovation. Understand the building blocks of business model, how to do a strategic reflection by looking beyond your existing business model, different types of business model innovation, and learn cases on digital transformation in different industries and why every manager in the company needs to understand and review their business model. Participants shall work in small groups and apply what they have learned during the seminar. Participants will also get a FREE soft copy of Mansmith's Business Model Map and the 4Es template on formulating business model innovations plus FREE email consulting within 30 days after seminar to attendees, indispensable support to help you cross the transition from existing industry paradigm to establishing new rules in your industry. · What is business model innovation and why is there a need for business model? · 8 cases on digital transformation and why every manager in the company needs to understand and review their business model? · Why CEOs around the world is looking into business model innovation more than product/service innovation? · How to draw, describe and communicate your business model in a 1-page visual map everyone can understand? · Why many companies continue to invest in cost that does not add value? · What are the differences and similarities between business model innovation and blue ocean strategy? · What is the relationship between resources, processes and value network? · Why failing business model is hard to leave? · What’s the implication of falling in love with best practices? · How to do a strategic reflection by looking beyond your existing business model? · How to maneuver business model to attain superior value for customers, consumers and stockholders, as well as attain competitive advantage? · What are business model archetypes? · When should you change your business model? · What are specific steps to formulate business model? · How to diagnose using business model evaluator and spot weaknesses in your business model design? · How to use business model explorator to select the best option to serve your needs ? How to make business model innovation work in your company? Target participants: Ideally, the entire management team composed of CEO, managing director, SBU head, head of functional areas such as marketing, sales, product development, R&D, finance, strategic planning, OD, operation, HRD and the like. Individual participants are also welcome. JOSIAH GO is bestselling author of 18 marketing and entrepreneurship books. He started his involvement in business model innovation via his Blue Ocean Strategy qualification process in France in 2006. He then proceeded to introduce Market-Driving Strategy in 2009 and Strategic Innovation in 2010 (recently renamed as Mastering Innovation). He not only teaches business model innovation, he has long applied the concept in the 1990's in his entrepreneurial company, beating a well-established multinational competitor to become market leader of a consumer durable business. His dedication to lifelong education has brought him to places like MIT Sloan, London Business School, Blue Ocean Strategy Institute (France and New York), Harvard, Kellogg and Wharton and has empowered him to help your firm apply the Business Model Innovation technology in an easy-to-understand, thought-provoking, inspiring case example method. 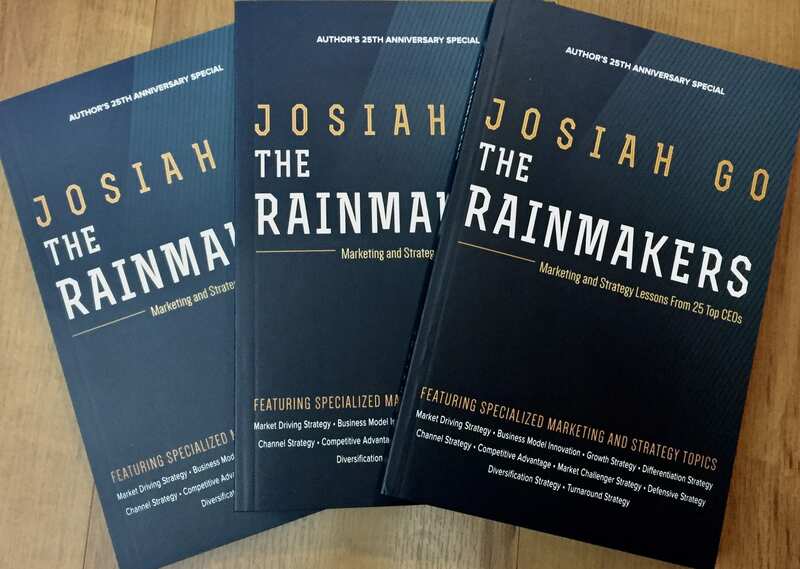 Josiah has personally facilitated over 1,000 marketing and strategy workshops here and abroad since 1990. For pioneering and successfully sharing many educational initiatives, "Joe" was honored as one of the Ten Outstanding Young Men (TOYM) of the Philippines in 2001, and one of the Ten Outstanding Young Persons (TOYP) of the World in 2002 in the field of business education (the first and only Filipino awarded to date) and was bestowed by his peers the rare Lifetime Achievement Award in 2007 by the Association of Marketing Educators (One of only two marketing educators in the Philippines given this honor). He was also accorded the World Brand Leadership Award in 2009 (India), and the International Who’s Who of Intellectuals (England).